FREDERICTON (U SPORTS) – The UNB Varsity Reds scored in the first and second periods, added an empty-net goal late in the third, and Etienne Marcoux (Terrebonne, Que.) stopped all 20 shots fired at him, en route to a 3-0 victory over the Acadia Axemen in the first semi-final of the 2017 U SPORTS Cavendish Farms University Cup. 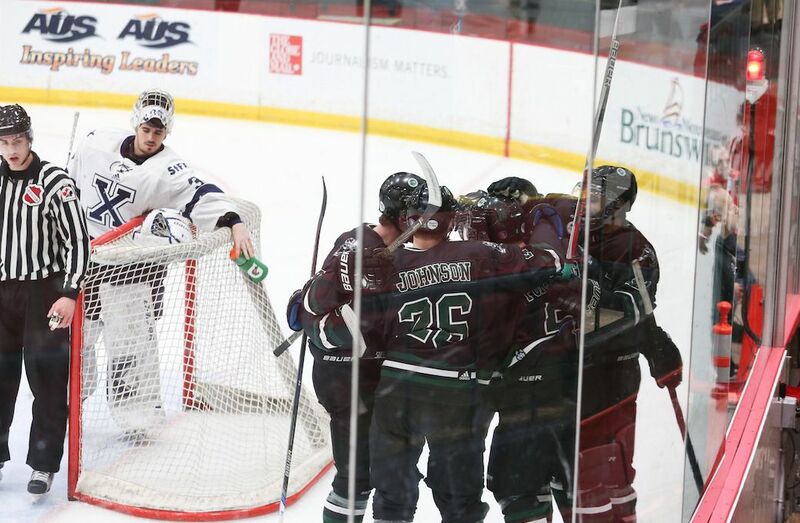 UNB will now play the winner of the second semi-final between StFX and Saskatchewan. UNB opened the scoring on their very first shot on goal, at 4:28 of the first, when Chris Caissy (Campbellton, N.B.) drew defenders to his side of the net and slipped the puck to Stephen Anderson (Morell, P.E.I.) who put it past Acadia goaltender Robert Steeves (Moncton, N.B.). Despite trailing, the Axemen defense kept UNB’s snipers to outside shots and had a 6-5 edge in shots in the opening frame. In the second period, Jordan Murray (Riverview, N.B.) added another for UNB on the power play off a point shot that found its way past Steeves. Up by two in the third, Chris Clapperton (Cap Espoir, Que.) got behind a defender and rolled a nice pass to Phillipe Maillet (Terrebonne, Que. ), who put it into an empty net with 1:13 left. UNB outshot Acadia 30–20. It was a feisty and spirited game between the two Atlantic University Sport rivals, featuring plenty of hitting. UNB head coach Gardiner MacDougall was pleased with his team’s penalty kill, which kept Acadia to 0 for 6 on the power play. MacDougall also had high praise for his goaltender. It will be the third year in a row that UNB has appeared in the gold medal game and MacDougall acknowledged it will be a momentous occasion. Acadia coach Darren Burns was pleased with his team’s effort, despite the loss. Penalties: Clapperton (UNB) goalie interference 1:06; Mignardi (UNB) tripping 15:06; Beauvillier (UNB) high sticking 19:30. Penalties: Ferry (ACA) interference 2:44; Anderson (UNB) hooking 4:00; Makin (ACA) tripping 7:45; Caissy (UNB) high sticking 10:17; Clapperton (UNB) hooking 13:49; Pettersson (ACA) interference 16:20. Penalties: Hodge (ACA) roughing, Petgrave (UNB) roughing 1:37; Thomas (UNB) charging major, game misconduct 3:43. POWER PLAY: UNB 1-4, ACA 0-6. ADIDAS PLAYERS OF THE GAME: UNB – Etienne Marcoux, ACA – Geoff Schemitsch. Start: 12:06 p.m., End: 2:45 p.m., Length: 2:39.